...and why did he interview UW School of Nursing Dean Mary Burman? James Kuster, RN, BSN, is currently a Doctor of Nursing Practice (DNP) student at the University of Wyoming Fay W. Whitney School of Nursing, focusing his studies in the Psychiatric Mental Health Nurse Practitioner option. In fall of 2014, he became the first Graduate Nursing Student Academy (GNSA) Liaison for the state of Wyoming. Says Kuster, "The American Association of Colleges of Nursing (AACN) formed the GNSA to provide high value programs, services, and resources to nursing students enrolled in master’s and doctoral programs." 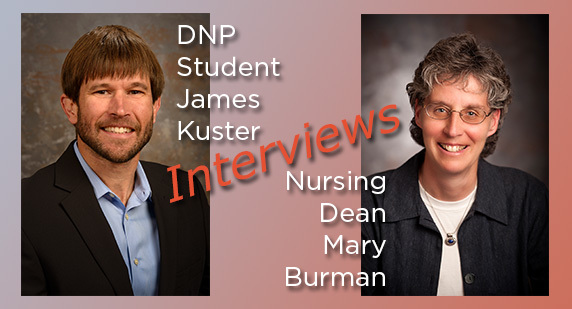 Kuster conducted the interview with Dean Burman as part of the GNSA "Great Minds in Nursing" video series. According to the February 2015 GNSA Bulletin, "Dr. Burman discusses her career trajectory to her current position as dean of the School of Nursing and her work with a low-income and uninsured-serving clinic, which provided her with great leadership experience." The University of Wyoming’s aim to lead health care innovation through education, practice and research reflects Kuster's short-term goal—to acquire the knowledge and skills necessary to improve the quality of care for mental health patients. A focus on rural health is another aspect of the University of Wyoming’s philosophy that reflects Kuster's short-term goals. He was born and raised in a rural community, and therefore says he has a passion to one day practice in such a setting. Kuster notes, "An advanced practice degree in psychiatric mental health nursing from a university with a rural health focus will provide the proficiency to meet the unique needs of those suffering from mental illness in rural populations." Finally, the University of Wyoming’s DNP program focuses on preparing practitioners to be client advocates with an overarching goal of improving health care delivery. "This focus," says Kuster, "reflects my long-term goal of becoming a strong advocate for increased federal and state funding." "The state of Wyoming offers many opportunities," Kuster concludes. "I look forward to learning and practicing here." On October 20, 2014 Kuster became the first Graduate Nursing Student Academy (GNSA) Liaison for the state of Wyoming [as noted above]..."As a GNSA Liaison, I serve as the point of contact for fellow students in all information related to the GNSA, and will have opportunities to provide feedback and programming suggestions directly to the Leadership Council." In addition, Kuster has been invited to attend the AACN Student Policy Summit in Washington, D.C., where he will be immersed in program sessions focused on the federal policy process and nursing’s role in professional advocacy. Kuster is also the president of the Institute of Health Improvement (IHI) Open School Chapter at the University of Wyoming. The mission of the IHI Open School is to advance health care improvement and patient safety competencies in the next generation of health professionals worldwide. "As president," says Kuster, "I am responsible for directing recruitment of members, learning activities, and large educational events." Last, Kuster signed the Wyoming Psychiatric Nurse Practitioner contract, further committing to practicing here [in Wyoming] after graduation. Kuster, acknowledging his several commitments, says, "I will continue this dedication to improving health care in the state of Wyoming." "To fulfill my passion for working with those struggling with chronic and debilitating mental illness in an advanced practice role, to improve quality of care for rural mental health patients, and to increase mental health care access to individuals living in Wyoming." "These plans will be met," continues Kuster, "by practice mental health care at an existing clinic or hospital." "Then [I hope to] open a private practice with a focus on delivering care to underserved individuals in Wyoming." "To become a strong advocate for increased federal and state funding—to provide community resources for those individuals who experience mental illness. As a former board member for a non-profit organization and a member of the National Alliance on Mental Illness, I have learned to appreciate the importance of advocacy at the federal and state level. It is my desire to impact the direction of funding and possess the expertise fundamental to being a credible patient advocate. I am confident the University of Wyoming and a long-term commitment to the state will put me on the path to reaching these goals."